Earlier this year, the city took down the dead birch tree in the parkway. I've driven by a couple more on my way to work and it does not appear that the winter was kind to them. Maybe birches aren't suitable to a suburban environment either. 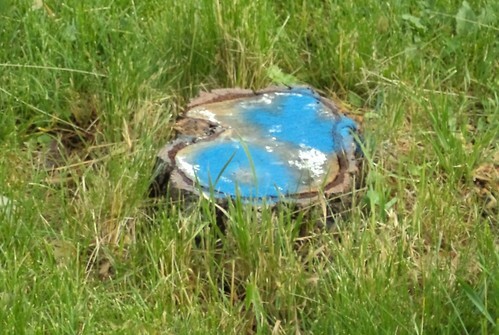 In June, I came home and this had been sprayed on the remaining stump. Okay for what? The big stump from the ash to the south of my drive also bore this. I kept meaning to call the city to find out what this meant but I'd get distracted and then not remember until about 10:30 at night, hardly the time to be placing a call to the city arborist even though I know he has voice mail. 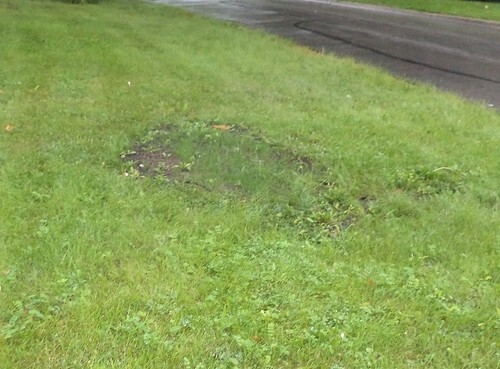 In mid-July, the ash stump was ground out and cleaned up. The ground was raked and grass seed planted. I didn't know if the city had done it or if the neighbor had paid someone to come do it. This is pretty close to the ground so it could just weather away, as far as I was concerned, if I have to pay to have it ground. I realized, looking at the grass surrounding the stump, the "ok" meant the tree stump had been treated and was found okay for saplings. There wouldn't be anything noxious growing here. I came home from work one Friday and found the stump gone, the shavings removed, the ground covered with dirt and grass seed planted. This is what it looks like now. Come spring, I should toss more grass on the plot and it will fill in. In a couple years, you'll probably never know there was a tree there. I don't miss it and it makes mowing the parkway so much easier.